Upside Down Bird: White-breasted Nuthatch /Hawks Aloft Inc. 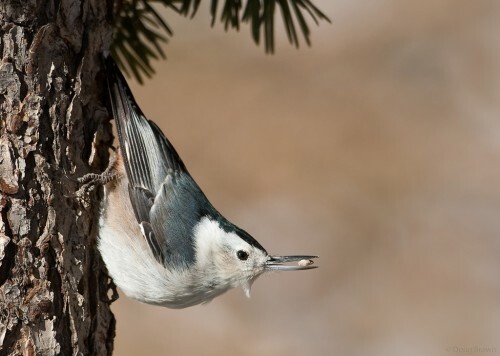 They are sometimes called the Upside-down bird for their habit of walking down the side of a tree rather than the more normal upward motion of other birds. A cool little fellow, White-breasted Nuthatches are common and a pair may stay in one area all year long. When they find large nuts and seeds, they jam them into the bark and hammer them open, but also store seeds and insects one at a time. One of my favorite pastimes is watching the different feeding behaviors of birds at my feeders. While other birds camp out in the platform feeder, feasting, the nuthatch perches on the side, gives a quick look around, snatches one seed and then is off to either stash it or eat it. They are among my favorite feeder birds.